Jack Charles v. The Crown is definitely an experience, to say the least. It’s a tale of heart ache, pain and suffering that holds a hope and resilience that is just as relevant today as it was when the injustices took place. Jack Charles is an actor from Australia, but it’s hard to define Jack Charles by that one title. He is also an Australian Indigenous Tribal Elder, drug addict, survivor of physical and sexual abuse, thief and homosexual. Jack Charles is way too complex to fit into one category and way too unique to just fit into the labels listed above, but they all helped define the person he has become today. Jack Charles v. The Crown is a dramatic autobiographical multimedia presentation with an onstage musical trio to accompany Jack’s journey from Australian residential schools to television fame to prison and back again. The story is an intense gut-punch to the realities of the abuses perpetrated towards young men and women of Aboriginal descent who ended up in the care of the State. It’s a story that even resonates here in Canada as we come face to face with our own time for truth and reconciliation. Jack Charles v. The Crown is a little bit difficult to understand off the top if you don’t already have pre-existing knowledge of who Jack Charles is. The first ten minutes Jack Charles spends at a pottery wheel making pottery while video clips of him rigging heroin and news clips of his arrests and charges play on a screen directly over his head. When Jack Charles finally addresses the audience he comes in fast and hard and full of passion. This is his life, and he wants to share his story, the story of how a young Aboriginal boy who was taken away from his family at 3 months old and placed into a residential school was assimilated into a whitewashed Judeo-Christian society who never truly seemed to have a support network in place for all of the trauma and confusion he endured growing up. But despite the mature themes and heavy issues at play Jack Charles v. The Crown is light-hearted and full of laughs and intrigue. While Jack Charles is full of his vigor and passion it’s obvious that he’s having so much fun on stage. The biggest problem with the show is really on me, not on Jack Charles, he has a very thick Australian accent and uses quite a bit of Boon Wurring dialogue, with translations in the program. It took me quite some time to actually be able to figure out what Jack Charles was saying, but once I got used to the accent it was smooth sailing. One of the best parts of Jack Charles v. The Crown was the incorporation of the music. 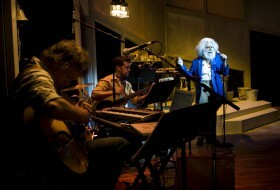 The show is full of musical numbers, some which Jack Charles participates in, others where the trio do their own thing. The music just brings an extra sparkle to Jack Charles eyes and you can tell in the moments when he picks up his guitar and starts to sing along that he is in element. Jack Charles v. The Crown is a very powerful, yet relatively short, piece of theatre which is definitely important in not exposing the past abuses and trauma to be committed under colonialism but as a beautiful poem of reconciliation with a heavy theme of bringing justice for those who have lived lives of injustice. Jack Charles v. The Crown is only in town for a very short time. It wraps its run at the National Arts Centre on Saturday, January 16, 2016. So make sure to check out this wildly entertaining yet heart breaking tale of injustice and the personal redemption that follows. Get your tickets here. But that’s just my opinion and I’d like to know what you think. What did you think of Jack Charles story? What lessons do you think we as Canadians can take away from the tragedies that Jack Charles endured? Join the discussion in the comments below.